[S12] C. Arnold McNaughton, The Book of Kings: A Royal Genealogy, in 3 volumes (London, U.K.: Garnstone Press, 1973), volume 1, page 511. Hereinafter cited as The Book of Kings. [S4553] Sten Holtermann, "re: von Rosen FAmily," e-mail message to Darryl Roger LUNDY (101053), 1 April 2010. Hereinafter cited as "re: von Rosen FAmily." Elizabeth Alice Abel Smith was born on 5 September 1936 at Kensington Palace, Kensington, London, EnglandG.2 She is the daughter of Colonel Sir Henry Abel Smith and May Helen Emma Cambridge, Princess of Teck.1 She married Peter Ronald Wise, son of Captain Anthony Forster Wise and Eve Elizabeth Glentworth Baillie, on 29 April 1965 at London, EnglandG.2 She and Peter Ronald Wise were divorced in 1975. From 29 April 1965, her married name became Wise. [S12] C. Arnold McNaughton, The Book of Kings: A Royal Genealogy, in 3 volumes (London, U.K.: Garnstone Press, 1973), volume 2, page 513. Hereinafter cited as The Book of Kings. [S12] C. Arnold McNaughton, The Book of Kings, volume 2, page 536. Peter Ronald Wise was born on 29 December 1929 at Kensington, London, EnglandG.3 He is the son of Captain Anthony Forster Wise and Eve Elizabeth Glentworth Baillie.2 He married Elizabeth Alice Abel Smith, daughter of Colonel Sir Henry Abel Smith and May Helen Emma Cambridge, Princess of Teck, on 29 April 1965 at London, EnglandG.3 He and Elizabeth Alice Abel Smith were divorced in 1975. [S466] Notices, The Telegraph, London, UK, 30 December 2004. Hereinafter cited as The Telegraph. [S1239] Tom Smith, "re: Richard Francis Abel Smith," e-mail message to Darryl Lundy, 19 January 2005. Hereinafter cited as "re: Richard Francis Abel Smith." From 28 April 1960, her married name became Abel Smith. [S1221] Michael (deceased) Ashworth, "re: Palmer Family," e-mail message to Darryl Lundy, 18 December 2004 - 3 November 2005, says 24 Oct 1931. Hereinafter cited as "re: Palmer Family." He was awarded the Officer, Order of the British Empire (O.B.E. )2 He was educated at Uppingham School, Uppingham, Rutland, EnglandG.4 He gained the rank of 2nd Lieutenant in 1931 in the Leicestershire Regiment.4 He fought in the Second World War.4 He gained the rank of Lieutenant-Colonel in 1943.4 He was awarded the Companion, Distinguished Service Order (D.S.O.) in 1943 and 3 bars (1943, 1944 and 1953).4 He gained the rank of Temporary Brigadier in 1944.4 He was appointed Commander, Order of the British Empire (C.B.E.) in 1944.2 He gained the rank of Major-General in 1957.4 He was appointed Companion, Order of the Bath (C.B.) in 1958.2 He was appointed Knight Commander, Order of St. Michael and St. George (K.C.M.G.) 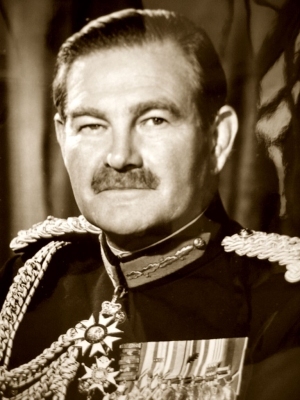 in 1963.2 He was Colonel of the Royal Leicestershire Regiment between 1963 and 1965.4 He held the office of Governor of Western Australia between 1963 and 1973.4 He gained the rank of Honorary Colonel in 1965 in the R.W.A.R.4 He gained the rank of Honorary Colonel in the SAS Regiment, Australian Army.4 He lived in 1984 at The Manor House, Islip, Northamptonshire, EnglandG. From 16 October 1980, her married name became Beaumont.